This letter was postmarked February 3rd 1974 from Los Angeles County, but according to the FBI files was only received by the San Francisco Chronicle on February 14th 1974. This mailing followed the 'Exorcist' letter, widely believed to be the final confirmed correspondence of the Zodiac Killer, mailed on January 29th 1974. There is little doubt however, that this communication was not mailed by the Zodiac Killer, and was likely authored by a Symbionese Liberation Army member or somebody loosely affiliated with them. The 'Exorcist' letter symbols at the foot of that communication were decoded by Kevin Robert Brooks to spell the words "To Kill", which although not proven, seems to be a better solution than most, in view of the word "Kill" the author placed on this letter and highlighted in quotation marks only five days later. If the 'Exorcist' letter and S.L.A. letter are connected, then it is very likely that both of these correspondences are dubious Zodiac material, along with a further two communications allegedly mailed by the Zodiac Killer in 1974. "Dear Mr Editor, Did you know that the initials SLA (Symbionese Liberation Army) spell "sla", an old Norse word meaning "kill". a friend". Sla in Old Norse does not mean "kill" as the author of this communication claimed. Sla in Old Norse means "to strike". Here is a PDF of Old Norse from York University, compiled by Ross G. Arthur. Qc64 Photocopy of envelope postmarked "U.S. 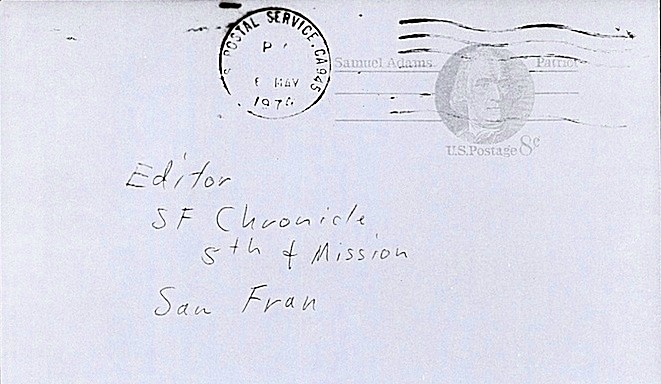 Postal Service, CA 913 PM 3 FEB 1974", bearing the hand printed address "Editor San Francisco Chronicle San Francisco, California". Qc65 Accompanying photocopy of sheet of paper bearing the hand printed message beginning "Dear Mr. Editor, Did you know that the....."
​According to the FBI files above, the S.L.A letter was mailed on or before February 3rd 1974 (postmarked 3 FEB 1974) from the 913 zip code of Los Angeles. The Zodiac Killer was a member of the S.LA. and was involved in the kidnapping plot. The letter was written by the Symbionese Liberation Army and had nothing to do with Zodiac. The Exorcist letter was without doubt a response to the San Francisco Chronicle article entitled 'Weird Goings on at the Movies,' published on January 11th 1974, detailing the audience reaction to the recently released Exorcist movie in 1973. Eighteen days later the Zodiac responded stating it was "the best satirical comedy that I have ever seen." Then this letter arrived. Paul Avery became very interested in the Patty Hearst case, continuing to cover the major stories of the day, and would collaborate with another Chronicle reporter Tim Findley to cover the unfolding Patty Hearst kidnapping and the exploits of the Symbionese Liberation Army. Paul Avery would later go on to author a book alongside Vin McLellan called 'The Voices of Guns' regarding these events. Zodiac Ciphers News-The SLA letter. 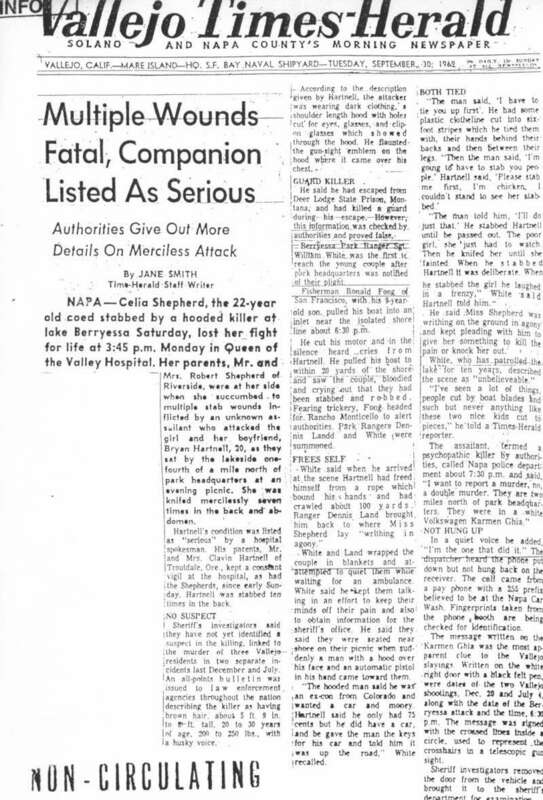 The S.L.A letter supposedly received at the San Francisco Chronicle from the Zodiac Killer on February 14th 1974, was actually mailed on or slightly before February 3rd 1974 from Los Angeles County, one day before the kidnapping of Patricia Campbell Hearst. The whole letter was geared towards the word "kill", revealing the meaning behind the Asian characters on the Exorcist letter, whitewashed from the January 31st 1974 newspaper article in the San Francisco Chronicle. In a previous article entitled 'The Symbionese Liberation Army and the Zodiac Killer', an S.L.A member was considered as the possible author of the February 3rd 1974 S.L.A letter because of the "Old Norse" reference. Sara Jane Olson (born Kathleen Ann Soliah on January 16, 1947) was a member of the Symbionese Liberation Army in the 1970s. She grew up in Palmdale, California, the daughter of Norwegian-American parents. The S.L.A letter was postmarked "U.S. Postal Service, CA 913 PM 3 FEB 1974" - the letter began with the word "Dear" and signed off with the rather tame "a friend". Zodiac researchers, understandably don't want to believe the letter was mailed on February 3rd 1974, because they have a vested interest going back decades, including printed material based on a 'Zodiac Killer' responding to the kidnapping of Patricia Campbell Hearst on or around February 14th 1974, despite the fact nothing in the S.L.A letter refers to the kidnapping. So, just for arguments sake, let us assume the Zodiac Killer mailed the letter on February 14th 1974, signing off the letter with "a friend". Dear Hearst Family, I am white, and I am sorry I joined the people who have your daughter. I saw her Wednesday and she was alright. She is brave and beautiful and innocent. Don't let her marry that Weed man. He talked to our brass last month and said how to set it up. He said if he marries her, he must have enough money to hold up his head. He got his idea from Miss Angela Davis, who gives orders and ideas to our brass. I am so ashamed to belong I am trying to get out easy, but God help me if they find out I write this. They are animals, but I don't think they will hurt her. God bless you, and God forgive me. For those still believing the S.L.A letter was mailed by the Zodiac Killer on February 14th 1974 - here we have a Symbionese Liberation Army member mailing a typewritten letter to the Hearst family on February 10th 1974, four days prior, beginning the letter with "Dear" and signing off with "A friend". Then, a matter of days later, the Zodiac Killer has returned after a near 3-year hiatus and just happens to accidentally mimic the Hearst letter (which wasn't published), beginning the letter with "Dear"and signing off with "a friend", while writing about the Symbionese Liberation Army. Even the die-hard proponents of a February 14th 1974 mailing cannot believe this to be the case. The 'Hearst Family' letter may have been authored by Sara Jane Olson (born Kathleen Ann Soliah), who could also be responsible for the S.L.A letter mailed from Los Angeles (913) just a week earlier, on February 3rd 1974. The "Old Norse" element of the letter drawn from her Norwegian-American ancestry.​ Both communications began with "Dear"and ended with "a friend". The 'Hearst Family' typewritten letter and envelope can be seen below, postmarked February 10th 1974, accompanied by a notation of "For FBI or Family" [corrected]. Click letter to enlarge. Click a second time to magnify. The 'Citizen' postcard was postmarked Alameda County and mailed to the San Francisco Chronicle on May 8th 1974. The author of this card was referring to the 1973 Badlands film directed by Terrence Malick and starring Martin Sheen and Sissy Spacek, released in New York and Los Angeles on March 24th and 29th respectively. The movie was based upon the real life events of Charles Raymond Starkweather (20) and his girlfriend Caril Ann Fugate (14). They were a pair of spree killers who embarked on a two month rampage, killing 10 people in total, including her entire family in the area of Nebraska and Wyoming back in 1958, before they were finally captured. ​Charles Raymond Starkweather was sentenced to death and executed in the electric chair at Nebraska State Penitentiary on June 25th 1959, while Caril Ann Fugate received a life sentence but was ultimately paroled after seventeen years,.in the June of 1976. 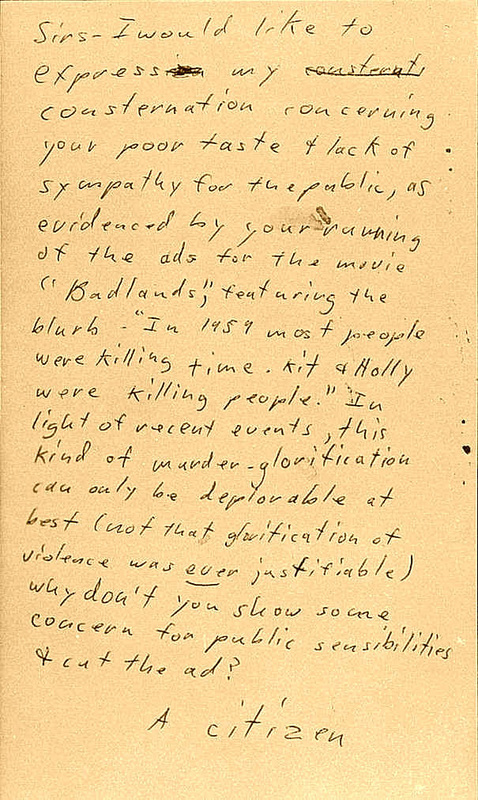 "Sirs -- I would like to expression my consternt (crossed out) consternation concerning your poor taste + lack of sympathy for the public, as evidenced by your running of the ads for the movie "Badlands", featuring the blurb: "In 1959 most people were killing time. Kit + Holly were killing people." In light of recent events, this kind of murder-glorification can only be deplorable at best (not that glorification of violence was ever justifiable) why don't you show some concern for public sensibilities + cut the ad? A citizen". This card and the previous S.L.A. letter marked a deviation for the Zodiac Killer, in the way he signed off both communications. Instead of the ominous crosshairs and running victim count, he would sign off with "A citizen" and "a friend", and either marked a shift of personality within the murderer or both letters were simply not mailed by the Zodiac Killer. 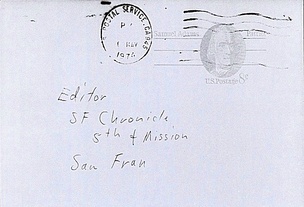 This correspondence and the Exorcist letter, both mailed in 1974, seemingly showed the author's interest in these 1973 movies, dedicating two communications to the subject and mailing both to the San Francisco Chronicle. Therefore, even more curious that the two movies released in 1971 received absolutely no attention whatsoever from the Bay Area killer. One month after the Los Angeles letter of March 13th 1971, a Zodiac film was released on April 7th directed by Tom Hansen, and later that year the blockbuster 'Dirty Harry' movie, based on the Zodiac Killer, was released on December 23rd 1971 directed by Don Siegel. It would seem unimaginable that a killer who so craved attention and publicity would fail to capitalize on such a veritable banquet in his name, unless of course he was indisposed. Was the Zodiac Killer incarcerated during this period? In fact, the Zodiac Killer remained quiet for nearly three years according to the widely held consensus, although it is extremely likely none of the 1974 communications were mailed by the Zodiac Killer (the Exorcist letter the only possible exception). Here is a small extract from the above two articles: In the Telegraph under the title 'Citizen Kane 'feud' between Orson Welles and William Randolph Hearst thaws after 70 years' it states "When Welles' masterpiece was released in 1941 Hearst, who was the partial inspiration for the movie, was incensed and banned his newspapers from reviewing or even mentioning it". Therefore, it must be an amazing coincidence that the Citizen card called for "cutting the ads" before signing off with "A citizen". Not to mention that the release date in Los Angeles, California for the movie Citizen Kane was May 8th 1941 - the exact date this correspondence was postmarked, on May 8th 1974. Zodiac Ciphers News-The Citizen Card. Patty Hearst. Click image to read on Wikipedia. Citizen card envelope. Click to enlarge.